If you ever doubted Sherry’s unique ability to pair with food, Javier Muñoz Soto may be the one to convince you. He is the chef at the family-owned restaurant La Carboná in Jerez de la Frontera. The restaurant is situated inside what was once a Sherry bodega, later a grain store and latterly a restaurant. The cobwebs have gone but the high ceilings, terracota tiles, wooden beams, whitewashed walls and blackened barrels remain. It’s a gorgeous space, with huge wickerwork lampshades that hang low over the tables, and an open fire in the middle for cool nights. 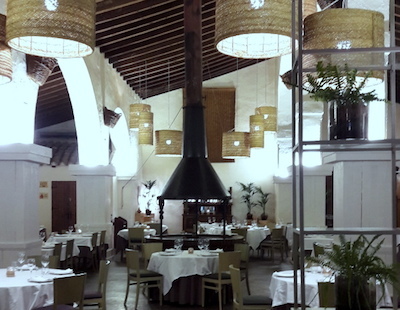 Attached to the restaurant’s name are the explanatory words: cocina con jerez, cooking with Sherry. Javier’s idea – practically his mission – is to show that Sherry can take you comfortably all the way through a meal, complementing and enhancing the cooking. About half of all his dishes are marinated in Sherry, or accompanied by a Sherry-based reduction or gently braised in a Sherry-rich sauce. The menu is not overly long and full of delicious quirks and surprises. 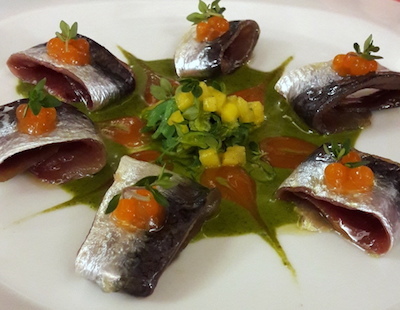 If you decide to order à la carte, be sure to try the glistening, marinated sardines rolled up and served over ajo blanco with an Oloroso-based emulsion, or the tasty little partridge parcels in escabeche, spiked with orange zest and Fino. 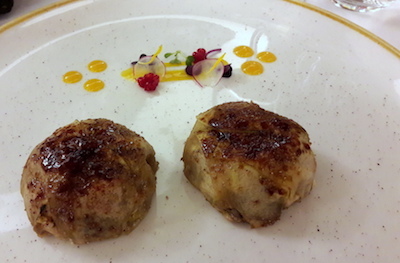 True Sherry aficionados will go for one of the chef’s two menus where each dish is matched with a different wine. The first menu (a snip at €40) gives you five courses and a glass each of Fino, Amontillado, Oloroso, Palo Cortado and a Medium with dessert. The second, also five courses and costing €60, features a succession of aged and singular Sherries (they call this menu VORS, even though not all the Sherries offered are aged the requisite 20 or 30 years to qualify as VOS (Very Old Sherry) or VORS (Very Old Rare Sherry). With this one you get a glass each of Amontillado, Manzanilla Pasada, Palo Cortado, Oloroso and brandy to wrap things up. The Sherries for each menu change regularly so you never quite know what to expect; it’s part of the fun. Amongst the Finos you might get a glass of Bertola from Diéz Mérito (whose bodega, just around the corner from the restaurant, is worth a visit) or Jarana from Lustau. Manzanillas range from Zuleta’s La Goya to La Guita from the eponymous bodega, or Solear from Barbadillo. The aged/singular selection may include a copita of La Panesa from Emilio Hidalgo or you may strike lucky with a glass of Macharnudo from Equipo Navazos or a Palo Cortado Antique from Bodegas Rey Fernando de Castilla or Lustau’s Almacenista. Be sure to ask the waiter which Sherries they are serving. Strangely, considering the restaurant’s reputation as Sherry champions whose role (as I see it) is to educate and initiate those new to this exciting, little-understood wine, they don’t always make a point of mentioning the name or showing the bottle. Though Sherry is the leading light of the wine list and the house speciality, Javier is also keen to showcase what he calls “las bondades de los vinos de la Tierra de Cádiz” – the bounty of the wines from the Tierra de Cádiz region, increasingly made by the Sherry bodegas to meet the demand for both white and red wines, which they call vinos tranquilos. A good example is the newly created (2014) boutique Bodega Forlong in Puerto de Santa Maria (the name is a play on for long, indicating the aspirations they have for the project to continue for a long time). 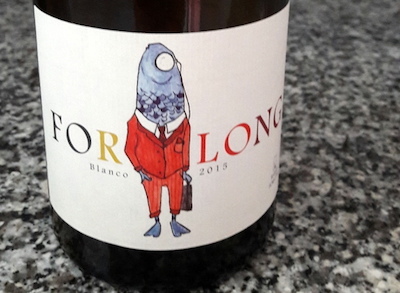 Forlong blanco is a blend of Palomino with some PX, grown on the chalky white albariza soils of the region: a rich, leesy mouthful whose astonishing 16% alcohol (more than many Sherries) is well enough balanced to pass almost unnoticed – I loved it with a powerful dish of black rice with squid, ceps and allioli. The same bodega makes a sinewy red blend of Syrah, Merlot and the local Tintilla de Rota, fermented in huge, 100 year-old clay vessels (tinajas) and aged in oak, which would be more than a match for the chef’s celebrated rib-eye steak (come hungry if you order this one). Alternatively, if you want to depart from the region, winewise, they have a good list of Ribera del Duero (Dominio de Pingus, Pesquera, Pago de Capellanes among others) and a decent Rioja selection including wines from Baigorri, Marqués de Riscal, Muga and more. S. S.